Uber Does Not Pay Service Tax, But Should They? After losing it out in the Vodafone case, the tax authorities seem to be uprooting other top business players for tax defaults. This time it’s the Service tax department pursuing Uber. The premium cab service provider has 1200 cabs registered under it with very satisfied drivers and customers. The cab service that debuted in 2013 has almost doubled it’s profits in just a year. The San Francisco based company has no big office in the country and all it does is connect the cab driver and customer. The drivers use their own cars and are given free iPhones and they go about driving customers that Uber app notifies. Some months ago, Uber Inc was noticed to have not taken the 2 factor authentication seriously. The RBI is not happy. Now the Service Tax department has noticed Uber has not paid nay service tax till date. Rival cabbies like Meru, Ola seem to pay service tax ad valorem, Uber somehow seems to ignore it. “We have sent a tax enquiry to Uber Inc. So far, they have not paid us a single penny in taxes. We have not sent them a demand notice as they don’t have an office in the country, but are operating through their Netherlands arm,” Mumbai Service Tax Commissioner SK Solanki was reported saying. However the department has not quantified it, it says it will do so when the representative of Uber meets the service tax department officials. 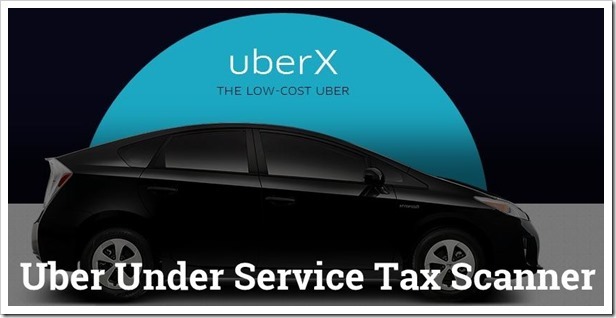 Should Uber Pay Service Tax? Looking strictly at the ground rules, Uber’s services does not fall under “rent-a-cab” service because Uber does not rent any of it’s cars for passenger carrying purpose. All it does is it connects the driver and customer over an app. The customer pays Uber and for having given the driver a customer, Uber deducts some amount and the balance is paid to the Cab driver. So it’s a tough road ahead for Uber on the Indian roads. There are only two outcomes to this case, either charge Uber retrospectively or Uber will bid adieu to Indian customers. "Uber Does Not Pay Service Tax In India, But Should They? ", 5 out of 5 based on 1 ratings.